As you stand atop a high mountain, what do you see? As far as the eye can see, there are deep ravines, cascading valleys, broad plains of beautiful wildflowers, flowing streams and rivers, and crystal clear lakes. All of these wondrous sights enable us to be in awe and wonder of our Creator who is worthy to be praised! As great as a physical mountain top vista is, how much greater is a spiritual mountain top experience, when you are allowed to sense the presence of the Lord in a fresh new way! I had such an experience this past week, as my husband and I attended a church conference that truly revived my spirit. In every conference session, worship service, and the many other events that I participated in, the Lord truly spoke to my heart. And incidentally, our conference was in an actual mountain setting! On one afternoon at the conference, many of the women attended a session that was just for our ears only, called “Woman 2 Woman”. We heard from a pastor’s wife who shared from her heart about “people pleasing”. I believe that all of us as women probably struggle with that from time to time, but the “people pleasing” syndrome can really trip up those of us who are pastors’/ministers’ wives. Being honest with ourselves, we all desire for those in our churches to like us and accept us. There is no such thing as a “perfect pastor’s wife”, therefore, we should stop trying to be one. There are some in our churches who expect us to be that way, and when we fail to meet peoples’ unrealistic expectations, we feel rejected, ostracized, and our feelings are greatly hurt. 1. Minimize what others think of me. What I learned: People will always have their opinions about what you should or should not be doing. Only those who are a part of your trusted inner circle, such as spouses, family, friends, mentors, etc. can be trusted to truly speak into your life because they love you and can genuinely give valuable encouragement and sometimes much needed constructive criticism. 2. Minimize what I think of myself. What I learned: Many times your own opinion of yourself can be too high, thinking more of yourself than you should, causing arrogance and pride. Or your opinion can be too low, leaving you with feelings of worthlessness or self-pity. In order to have a balanced view of yourself, you must know who you are in Christ, it is only in Him that you know your true worth, remember He died for you because He loved you. 3. Maximize what God thinks of me! What I learned: As you grow in Christ make it your primary goal in life to strive to find out what pleases the Lord. This is what we are commanded to do in 2 Corinthians 5:9 and Ephesians 5:10. If your ways are pleasing to Christ,isn’t that what truly matters? These words of affirmation are just a snippet of the many things that I either learned afresh or was gently reminded of from the mountain top. Again, I thank God for all that He poured into my heart during that memorable week, and I am grateful to share this small sample with you. Today, July 27th, we are taking a vacation day from our church to visit our daughter and son-in-law's church; First Baptist Church of Cleveland, Tennessee. It is a special day because it is the day that Kinley Grace, our granddaughter, will be dedicated to the Lord by her mom and dad. Cameron Lee was also dedicated to the Lord when he was about her age. I call them babies because they are. Kinley Grace will be 6 months old the 10th of August. Cameron Lee will be 20 months old next Monday, the 28th. We are experiencing more "Fruits of the Labor". It is a joy to witness our children as adults, serving God. 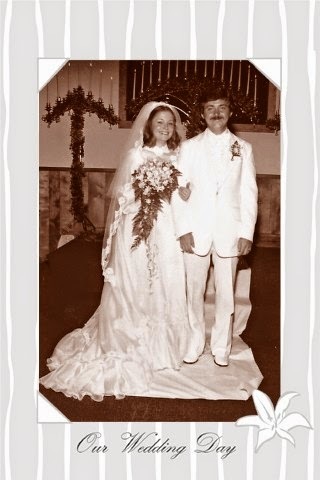 August 3, 1979, I married my best friend. Now, almost 35 years later, two children later, two children added by married later, two grandchildren later, seven homes later and tons of memories later................if I had it to do all over again, I would say "I do" in a heartbeat. (It is not my time to blog during our actual anniversary, so I am posting this early. Remember, I teach the preschoolers at our church. When they turn 2 years old they come to me and stay until the begin Kindergarten. We did a study on the life of Moses, starting when him as a baby. We got to the lesson about the 10 commandments a couple of weeks ago. I decided, especially since the majority of my kids are 2 and 3 year olds, to spend a day on each commandment and try to teach them all ten. The first Sunday, we talked about the 1st commandment: One God. Wednesday night, we talked about the 2nd commandment: Don't worship idols. Sunday we talked about the 3rd commandment: Don't use God's name in vain; speak God's name with love. Okay, you get the ideal...........anyway, each time, we reviewed back over the previous, so we are building and hopefully at the end, they will be able to recite the simplified version of the 10 Commandments. Sunday, one of my little girls (the one that asked me a few months ago what sin was. She wanted to know if when you have to go to time out do you sin and if you have to go to bed without a story, are you sinning. When I told her yes, her reply was, "well I sin a lot." She is 3 years old. Anyway, Sunday, after reviewing and going over and over the first three commandments, little Aubrie asked me, "Are all of the rules gonna be like these?" I asked her what she meant and she said, "Duh....they are simple; everyone knows that there is just one God and you can't talk bad about him and anything you put before him is an idol. Duh. It's simple." First, I was excited that she at least was understanding them, as a three year old is capable of doing. Second, I got to thinking.....she is very blessed because her parents care enough about her to be raising her in a Christian home and to take her to church and teach her about God. So to her, DUH.....it is obvious that everyone should already know the RULES, as they call them. No wonder God said to come to me as little children......they take everything so literal. God Bless the Little Children. If we would take the time, we could learn a lot by just sitting back and listening to them. 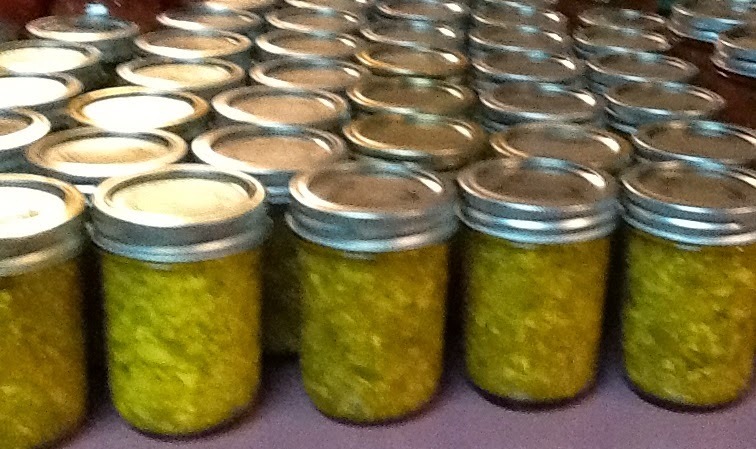 Below is Mrs. Mahalia's Squash Relish Recipe. It is good with beans, with hotdogs, with grilled chicken, with pork roast......in fact it is good with just about anything. Not only that, it is fairly easy to make. Boil three minutes and can. Mrs. Mahalia was 99 years old in December. 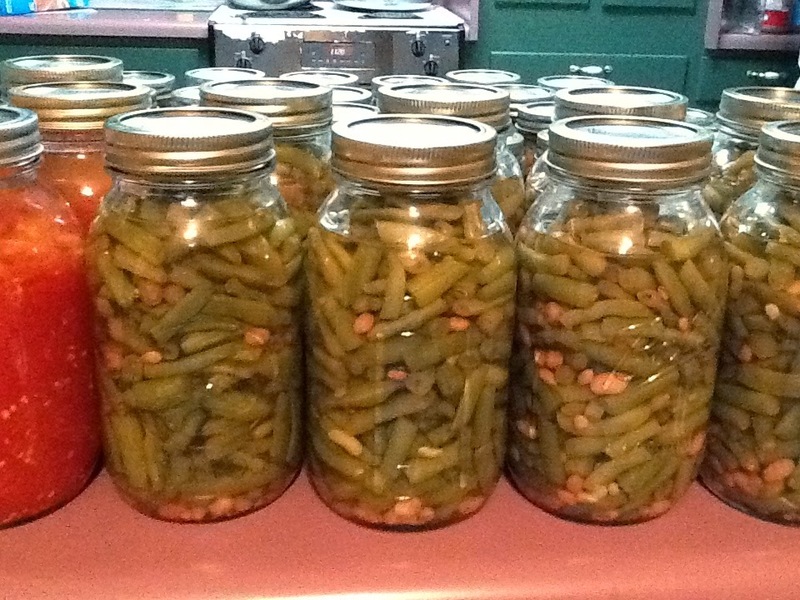 We visited her Sunday and she showed us the 28 quarts of beans that she has canned so far this year, as she was standing at the stove frying okra and onion, had green beans with new potatoes simmering and Mexican cornbread in the oven. She said she would serve it with fresh onions, pepper and tomatoes. One of my favorite parts of summer vacation, is the canning. I LOVE to can. There is just a certain amount of pride and accomplishment felt when you look at the fruits of your labor. My husband will plow up a spot for the garden; plant it and tend it, BUT....when the fruit starts bearing, it is my job to gather the garden and put it away for the winter. One of the sweetest sounds is the sound of the POP when a jar seals. I LOVE hearing it. This year, God has really blessed us. We do not have but a small garden spot, but because of the rain, we are still gathering those fresh veggies daily. We have given many away. We have shared with both of our children and my mom even brought some home with her. AND....I have canned the rest or frozen it. 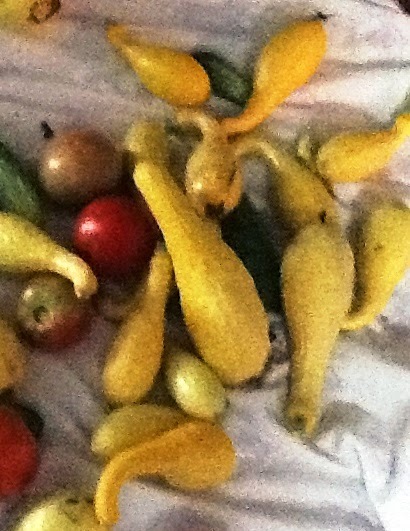 Just like our garden, my husband and I are reaping the fruits of our labor at our church. With that also comes a certain amount of pride and joy......not for what we have done, but for what God has done through us. As I've blogged many times, this will be our 18th year at the church so we are reaping the joys of watching some of the young ones that have grown up and matured as adult leaders. It is an awesome feeling. I love reaping the fruits of labor. As a public school teacher.....my summer vacation is about to come to an end. It has been way too short and VERY BUSY. I got a few things accomplished on my to-do list, but many things will have to wait. It has been a busy summer. Our moms live three hours away, in north Alabama. Our son and daughter-in-law, moved out of our home in the Spring to Gallatin, TN, which is also three hours from us. 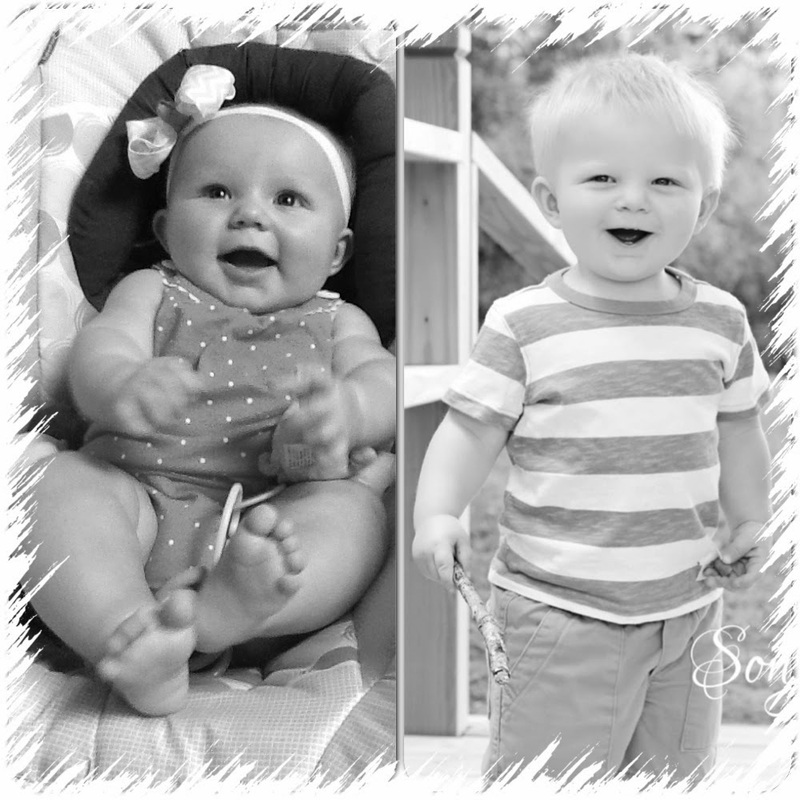 And our grandbabies are forty minutes from us in Cleveland, TN......so, although we have not gone on a huge vacation this year, we have put many, many miles on our vehicle, traveling back and forth to loved ones. We were able to bring my 80 year old mom home with us the 4th of July and she stayed 4 nights, which she thought was an eternity. During that time, she was able to spend time with her great-grandbabies, see our daughter's home, go to church with us...............and then she was ready to get home to her routine. Smile. We have got to visit our son and daughter-in-law a couple of times and enjoy them. Oh, how we have missed them. They lived with us for over a year. We are excited for them, though. Our son has been accepted for a very intense training program with the Corp. of Engineer and will be taking classes for at least three years. Our daughter-in-law was able to transfer from her Assistant Store Manager Training program to closer to their temporary home. She has also been accepted and starts back to school in a couple of weeks, working on her Masters in Education; a dream that she has had for some time. Our time with them for the time being is very precious and limited. We got to go camping with our daughter and son-in-law and two grandbabies. And, the grandbabies have gotten to spend several nights with us, giving mom and dad some much needed rest and giving Mimi and Granddaddy some much needed baby time. But....All Good Things Must Come to An End. My first day of school will be next Wednesday, July 30th. when it is our time to depart this earth, whether by death or the second coming of our Lord, how many to-do things will still be left hanging? I mean, the important things? My husband always says he hope that when it is his time to go, he is all used up; and that he has done and accomplished everything he meant to do and everything that God meant for him to do. All good things must come to an end.......we should live each day as if it is our last. Last summer I was 7, 8 and 9 months pregnant. I did nothing in my garden. This summer I am amazed at the flowers that have bloomed despite my neglect. The Japanese beetles ate on my roses last year along with the aphids, but still they came back prettier than ever. The weeds and ivy were worse this year because of the lack of attention last year, but the lilies have never been fuller. Even the plants that were stepped on by my exploring five year old have done alright. The pulling up of the ivy did not seem to affect the blooming of the tiger lilies. Going without rain has affected the cone flowers, but they are still there raising their faces to the sun each morning. I am so thankful that God continues to use us and grow us despite the effort we put into our spiritual growth for a season. He is faithful to pursue us, to grow us and make us beautiful even when we don't give Him the time or attention He desires and deserves. Yes, we need the spiritual water of reading His word and growing with other believers. We must remain in Him for He is indeed the vine and we are the branches. We should turn our attention daily to the Son. He does prune and tend to us to make us more fruitful. There is indeed lots we can learn from and many ways we can grow just by looking in our own backyard. Dear Sister, Open your eyes to whatever He is trying to teach you right where you are. If I Ever See Any More Ivy . . . When we first moved in, I loved the ivy that grew out of the raised flower bed in the backyard. It cascaded over the railroad ties that separated the garden from the grass. It was limited to the alternating corners between the pink, purple and white blooming ground cover that flooded over the sides as well. This spring, seven years later, the ivy was everywhere. I had not tried to tame it, so it grew and spread and spread and grew. Not having been pruned, the ivy was rapidly taking over the entire bed. The blooming ground cover only bloomed pink where the ivy had choked out the other two colors. Not realizing what an ordeal it would be to clear a small area for a tomato plant or two, it took me two afternoons to cut and dig and tug and pull the ivy clear of just that space. I looked at how clean and kept that portion of the bed appeared and realized that the ivy needed to be fought on a much larger scale. The romantic look that had once appealed to me had overwhelmed the entire garden to the point I realized that all the ivy needed to go. Over the last few weeks as I have worked on ridding the garden of the ivy, I found that the pretty ivy had allowed poison ivy to grow beside it. Somehow the ivy didn't choke out the weeds, just the pretty things I had wanted to keep. Spiritually, God has shown me that this is how sin infiltrates my life. At first it looks pretty and desirable. Then it chokes out the fruit and takes over. I have grown so accustomed to it that it no longer bothers me until I get a glimpse of what my life would be like without it having so much control, consuming so much time and attention. Ridding my life of these sins are never easy. I have to turn them over to the Master to help pull up the roots to prevent them from coming back. I have literally filled 8 large compost bags of the ivy and weeds from this one flower bed. Honestly, I hope to never see another sprig of ivy again. Yet, I know I did not remove all the roots from the bed. The ivy will come back. I take courage in the knowledge that one day I won't have to fight the ivy of sin in my life anymore. So as I tackle the job again, I will rejoice that Christ won my battle over sin and death! I like to cross items off my to-do list. Sometimes, I write things onto my to-do list just so I can cross them off. I like the feeling of accomplishment that comes as I have completed a job and know that there is one more responsibility that is no longer hanging over my head. My garden is not like that. Like the laundry and the dishes, my garden is one more thing that if I dare write on my list, I will never be able to cross it off my list. I weed and water and fertilize only to weed and water and fertilize again. Spiritually, I will never be done on this side of heaven. As long as the Lord leaves me to live in this fallen world, I will always be a work-in-progress. There are sins to eradicate. There are more ways that I can be like Jesus. There are more scriptures to study and apply to my life. Praise Him! God does not leave me in this continual state of in-completion. He will finish the work He began and one day, I will be done. He will return or call me home and I will be complete. Yesterday, I wrote about the beautiful treasures that I have inherited in my backyard. I have found such joy in watching God's creativity come alive each year that we've lived in this house. However, I learned the very first year that we were here that I was in way over my head. With an afternoon ahead of me, I set to weed the large raised bed in the middle of our backyard. We only had one daughter at the time and she played in the yard as her daddy mowed. The sun was shining and all was right in the world. It felt great to be outside and I soaked up the sunshine. I appreciated the dirt under my nails and felt I had really accomplished something at the end of the day. When I put up my tools and bagged up the weeds I had pulled I only lacked a small section of the bed from completing my task. I would've finished, but my daughter needed fed and I was ready to call it a day. I had every intention of finishing the job in the next day or two. Well, the next day or two came and went. I never made it back out to the garden to finish the job I had begun. I was so glad I didn't. In the next couple of weeks I was dismayed to find that many of the "weeds" I had pulled, were not "weeds" at all! The section of the garden I never "got" to, continued to grow and, eventually bloom. In my ignorance I had uprooted some of the cone flowers I didn't even know grew in that garden. I realized then how valuable my gardening books and the Internet could be. I turned to my neighbor, my grandmother and my mother for their advice as I sought assistance from someone more knowledgeable than myself. Spiritually, all too often I forge ahead, assuming I know how to handle a situation or what to do in certain circumstances. I only realize later that I've missed blessings because I didn't wait on the Lord's counsel. I didn't consult His book. I didn't ask for help from Him or His people. The garden of my life needs the influence and the expertise of the Master. I cannot do it on my own. When we bought this house, I was SO excited about the large fenced backyard. It has large, mature trees, a raised flower bed and lots of established plant life. I had grand plans of "tinkering" around the yard with my pretty shears and floral gardening gloves. It was going to be so great. I learned two things relatively quickly about the previous owner. 1. She considered gardening her hobby, investing lots of money and large amounts of time. 2. She was not the mother of three small children. It really is something. These photos are some shots I took this spring. I know it sounds quaint and maybe a bit corny, but I thought for my blogging turn this week, that I would bring you some lessons God is teaching me through my garden. Who knew there were such lessons to be learned right in my backyard?! =Equals a really dirty, disorganized home! So….not only do I need to be kind to myself about what I am not doing spiritually, I need to be kind to myself about what I am not doing with this house! I leave tomorrow (again) to fly to California….take care of some things there….pick up what will fit into my dad’s hot red convertible sports car and drive it all of the way home to Indiana! I still have three grandchildren here so I will definitely not get the house cleaned before I leave!! What’s a few more weeks, right? Good grief….My suitcase is still not unpacked since I got home last time and I have multitudes of laundry to do so their mom won’t have to deal with it when they get home. Our five year old granddaughter has been singing every word to Frozen….and; I think she has quoted every line in the movie!! I haven’t seen it yet…and actually, I really don’t think I need to! She acts out what seems to be an entire script! There is one song that I sing over and over in my mind….and I only know three words….”Let it go….let it go…let it go! !” As I was singing that in my head just now…I realize that one major way I can be kinder to myself is to LET IT GO!! Overwhelmed with all you have to do? LET IT GO! Got too much stuff? LET IT GO! Bad memories? LET IT GO! I am looking forward to the drive….I might put the top down and cruise….who knows….maybe I will have so much stuff to bring back it will be piled up so high I won’t be able to put the top up!!! Or, perhaps, I need to LET IT GO and not bring back so much stuff!! LET IT GO my friend. LET IT GO! As I read over my last post, I realized that if you have not read my previous post/s you might not have known why in the world I had not been to our church in over 10 weeks….and, in fact, now it actually has been more like four months! So…if you are interested in understanding why a pastor’s wife is not going to their church….it is because I have had the honor and privilege to stay with/take care of my father (in California) as he approached the end of his life. That life ended two weeks ago….just two days after I came home for a short time to take care of some things at home...with the plan to return tomorrow to continue to care for him. Shocking. Sad. Heartbreaking. Then….five days later….my father-in-law’s life here on earth ended. Two amazing men. Two totally different men. And, as far as I know, two lives now spending eternity in two different places. My father-in-law is a part of a strong, Godly legacy. His father was a missionary in China. His son is a pastor, his grandson is a pastor and his grandson-in-law is a pastor. Generations who love and serve the Lord. Even though we miss him and are saddened that we won’t be spending time with him here on earth….we rejoice that he is with Jesus. My father, on the other hand, did not have anything to do with Jesus or the Bible or the church. He was super fun, always loved my friends and could chit-chat like no one other! There is no joy, however, in his death….because his suffering is not over. We recently arrived home from the funeral/celebration of life for my husband’s father….so sweet as my husband, son and son-in-law led the service. There was no service/celebration of life for my dad…neither he nor my mom wanted anything like that…so…I am now wondering how to have ‘closure’. After my mom died I went through a season of anger….angry with God for ‘not saving her’. The Lord was gracious to me and allowed me to work through that and come to the conclusion that my anger needed to be directed toward satan rather than God….and began to fervently work to fight against his schemes in the lives of my family, my church, my co-workers, the ladies He allows me to speak to, etc. This time I am not feeling anger….rather I am feeling numb. Paralyzed. Not sure what to do next….not allowing my mind to take it to places it ought not go…for fear of where it will take me. A dear friend texted me when I told her about not being in the Word, etc and she said I “need to be kind to myself! !” Wow! Really? Amazing!! “Give yourself much grace, Dana”, she said, “God sure does!” Wow! Be kind to myself??? What an awesome, freeing thought!! I can be so mean to myself for sure!! I am desperate to take those words to heart. I want to learn to be kinder to myself during this season. Allow myself to heal and grieve and quit being so hard on myself! I am pretty sure that many of you need to be told those words as well....perhaps you are beating yourself up for something you are not doing...or perhaps you are saying unkind things to your mind. I would love to encourage you, too, my friend….be kinder to yourself!! A Pastor's Wife Not "Doing"
Looking at the calendar I realize it has been over 10 weeks since I have been to our church...well actually, there was one week in there that I was in town and so was able to go to our church...but I wasn't "seen" (if you know what I mean) because I was in the nursery. That means no teaching, no speaking, no counseling church members, no praying with church members, no serving church members. None. Zilch. Zero. Zip. And...to be honest...part of me kind of likes it...which makes me feel guilty and yet part of me really dislikes it and misses it terribly. Does that make me a terrible pastors wife? Not only have I struggled with feeling guilty for not being able to serve and feeling guilty for kind of enjoying the freedom that that brings, I have fallen into the trap of thinking God might be mad at me for not 'doing'. Theologically I KNOW my salvation and HIS love for me is grace driven...but because my mind can still speak lies to my heart I often hear myself say things to the contrary. Lies like, "I need to do this or I must do that so He won't be mad at me, or so He won't take His hand of protection off of me, or blah, blah, blah".... more lies. Performance based love has been driven so deep into my heart and mind it is soooo hard for me to understand unconditional love. Gratefully, this season is teaching me that His love for me is NOT based on what I do or do not do...believe me, I have 'known' this academically, but forget to totally embrace it and live it. Aren’t you glad we live in a country where we can live free from tyrants? As Americans, we are free to choose the careers we desire. If we are so inclined, we can speak out for or against a certain issue without fear of being arrested. As women we are free to have an education. We are free to worship the One True God-the Jehovah Father, the Creator of the Universe-with fear of imprisonment or being put to death. We do not have to slip around in secret to attend church with fellow believers. Let’s take this freedom thought a little further. As a minister’s wife, we are free to choose what position we wish to fill at church. Some of us are capable musicians and CAN play the piano. Others are gifted teachers. The point is we do not have to accept any job that is open at church. We CAN choose what we wish to do. We CAN fulfill our passions and NOT what the church body believes we should do. As ministers’ wives we are FREE to be who we are in Christ. Yes, as Americans and ministers’ wives, we have freedom. However, we have another freedom given to us by the Heavenly Father. As humans God granted us freewill to choose Him or to reject Him. God is not a dictator who demands we follow His commands. Instead, the Father allows us to come to Him on our own. Yes, He desires each of us to turn from our sins and to accept His forgiveness and salvation, but He will never force it on us. As we celebrate our country’s independence this month, let us also remember the freedom God has given us. Summertime! After the cold winter we had, we are all ready for warmer weather and to be outdoors. Aren’t you glad God blessed the south with all four seasons? Here’s a thought. What summertime childhood memories flood your mind? Did you chase and capture lightning bugs in a Mason jar? Did you play Hide and Seek in the dark? Did you spread a blanket in the grass at dusk and watch the stars emerge in the night sky? Did you splash in the water sprinkler on a steamy hot day? As this summer begins, take time to create memories for your children or grandchildren. They grow up so fast. Set aside a day or night a week and have some quality family time. Chase lightening bugs, count the stars, splash in the water sprinkler, etc. At the end of that day, remember to thank God for your precious family. Oh and by the way ladies, not one thing listed cost a dime. They simply require for time and energy. So what are some fun, free summer activities are you doing this year?